Supreme Ventures’ sports betting brand, JustBet, just got better with the official launch of its mobile platform. 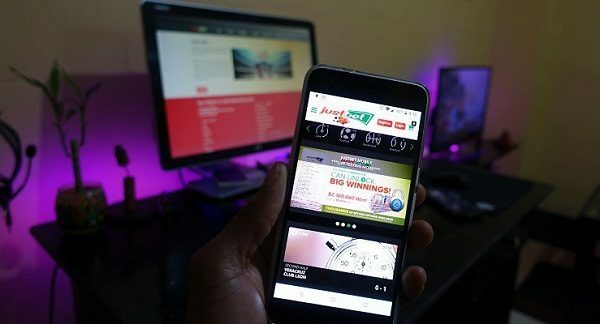 In addition to the 100 physical locations islandwide, avid sports fans and JustBet aficionados can now bet anywhere and at any time thanks to the new JustBet Mobile web-based application system. In order to place a wager, interested players first need an internet connection and an active NCB Quisk account to be to successfully register for a JustBet Mobile betting account. JustBet Brand Manager, Danielle Douglas said the move to mobile was made to allow players more convenience and flexibility when placing their bets. “We wanted to offer new and existing players the convenience benefit of being able to place bets from the comfort of their home, offices or while on the go. Once you have registered and have a NCB Quisk account, you can carry out the entire betting transaction online. There is absolutely no need to come into one of our stores to top up or claim prizes, everything can be carried out on the new mobile platform,” she said. JustBet Mobile is powered by Supreme Venture’s global technology partners, Intralot and NCB Quisk, the local market leader in mobile wallet services. However, there are plans to incorporate other forms of electronic payments over time. Once a player wins a bet, the prize money is sent directly to the linked NCB Quisk account. Players who want cash-in-hand can then withdraw the funds from their Quisk account, using any NCB ABM island-wide. Ms Douglas emphasized that the vast majority of current betting options offered in-store are available on mobile with the added benefit of real time odds updates at your fingertips. JustBet Mobile offers both pre-game and live betting options. “Bet, watch the match, and then bet again during the match if you desire,” she said. Persons can visit www.justbetja.com/getstartedfor more information on how to sign up for a JustBet Mobile betting account.